Getting your lighting right is crucial to professional-looking videos. But lighting kits are bulky and take forever to set up, and learning how to position them properly can be super frustrating. Before you know it, you’ve moved the lights back and forth, left to right, upwards and downwards, until you’re SURE that you’re just really not digging this whole video thing. When it comes to lighting, it starts with having a systematic plan that starts the SAME way for every shoot. Then, depending on your shooting environment, you’d adjust the lights systematically … not randomly. It takes a while to understand how lights work with you camera, and it might take a little while to get the hang of it, but once you approach lighting the same way every time, it becomes second nature. You’ll want to always start with the same set up, then move your lights accordingly, based on where you are. 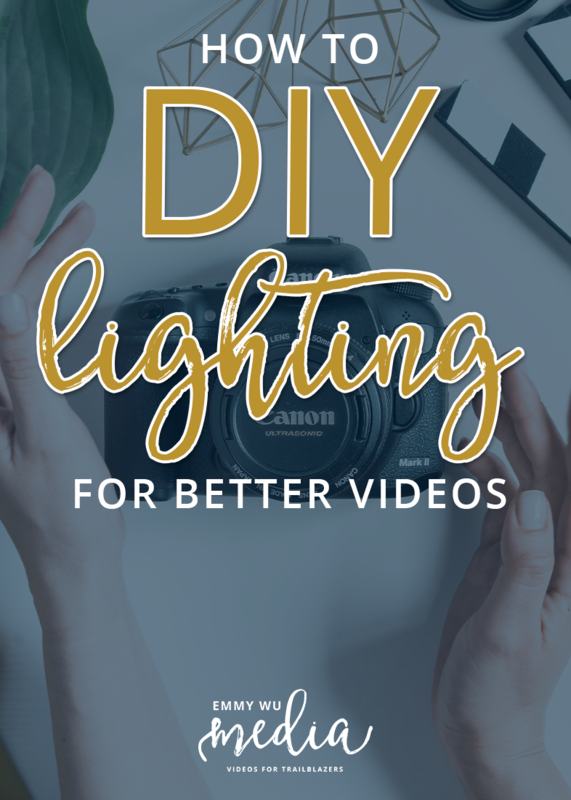 I hope that this video will be helpful for you when it’s time to set up those lights, so you can ditch the frustration and just get gorgeously lit videos. Hi, Emmy – Thanks for this helpful video on how to set up the lights for a video shoot. BTW I came here after watching the excellent training you gave on doing launch videos on Member Site Academy. I think it’s great you covered the why (we’d want to do it), the strategy, and the equipment for doing this, so I think I’m starting to grasp the fundamentals of doing this. (1) For each light being about 5 ft or less away, do you think 250 watts per light is enough? Or should I go higher? (2) You showed how to position the 2 lights. If I get a 3-light kit, where exactly would I position that? And what is the purpose of this 3rd light? Would it be ok to go with 2 lights to start and then add the 3rd light as I get more experienced with this? Hi Kevin! I’m so glad that you found the Member Site Academy training helpful! Great questions! If your lights are less than 5ft away, 250 watts should be enough, but it also depends on your shooting environment. If you’re in a dark space, you might find the lights cast a more direct light on you and results in sharp lighting “hot spots” and then shadows on other parts of your face. Generally, I prefer to have brighter lights (500W and higher) placed FURTHER away from you so they cast a nice, overall, luminous look. A 3 light set up is usually overkill for most home video shoots. This came from a traditional film set set-up where they also used the third light to light up the space BEHIND the subject. I would go as SIMPLE as possible and use only two lights, or even just one light if it’s bright enough! I hope this helps! Are you on Facebook? You should join my Facebook group Craft to Camera, where we chat all things video! Thanks so much Emmy! This totally helps, and in fact, no source I’ve come across mentions that it might be better to get a more uniformly lit bright scene like you described. I guess it’s like how you’re lit so well and uniformly under bright sunlight outdoors. I’m getting higher-wattage bulbs based on this insight. I was thinking 5 ft or less distance because there’s furniture in the way where I’m planning to shoot, but I’ll move things around so I can move the lights back further from me. Thanks again for making that light bulb go on in my head (pun intended)! Decision-making is so much easier when I get what the key factors are. Also, thanks for adding me to your FB group. I look forward to learning from you and everyone else on there. Rad video Emmy. Great stuff!